Many people choose to donate to charity in memory of a loved one instead of, or in addition to sending flowers at a funeral or memorial service. We are always very honoured to be thought of in this way. We are happy to send collection envelopes direct to you or to the funeral director. 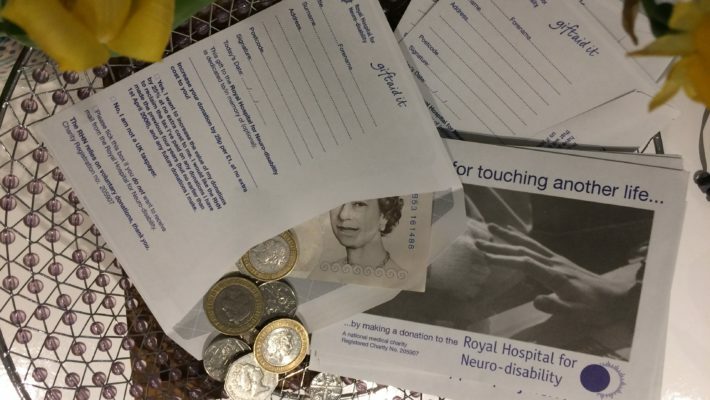 To request collection envelopes contact fundraising on 020 8780 4557 or email ibarrett@rhn.org.uk. Please send donations to Fundraising, RHN, West Hill, London SW15 3SW (please do not send cash through the post). We recommend that you set up an online remembrance page to channel all online donations. This is particularly useful for family and friends from far and wide who can’t attend the service. This gives everyone an opportunity to donate whilst sharing memories and leaving messages. Alternatively you can direct people to our donate now page where they can make a straight forward in memory donation. Please be sure to ask them to select the ‘In Memory of’ option in the drop down menu and to provide the name of the person in the comments box.